KUALA LUMPUR: While December is a month when Malay couples get married and hold their wedding receptions, a Malay political party is looking at “divorcing” its president instead. And certain quarters believe that the said president, Datuk Seri Dr Ahmad Zahid Hamidi, has “consented” to part ways with the party, Umno, before the year is over as he accepts the “divorce” terms, detailing a clear road map for his political future and position, which has been drawn up by senior party leaders. A veteran Umno member of parliament told the New Straits Times that “this is the only way forward for Umno”. “This is something that Zahid and other Umno MPs can agree on,” he said, claiming that 98 per cent of the 48 Umno MPs have agreed to it. “One senior leader has gathered about 30 MPs. They have made progress in the past few weeks. When will it (the move to oust Zahid) take place? Your guess is as good as mine,” he said, adding that most of those involved in the plan are Tun Dr Mahathir Mohamad’s loyalists. “Yes, it is true that one senior leader has 30 MPs with him, but everyone knows there is another senior who has the support of 38 MPs. They are bound to collaborate as most of the MPs are the same people. “At the end of the day, these MPs will decide whether Zahid stays or leaves. They (the MPs) are the ones representing the party and the people in Parliament,” he said. “We know there are those against this (Zahid’s removal), but we have to accept what the majority wants,” he said. “Since May 9, he has been struggling to show leadership,” he said. “There are lots of rumours going around and these rumours can become real, but they can also create camps in the party. “There’s a lot of uncertainty, but it depends now on what they want to do with the party. They say everyone has his own numbers, but for a better 2019, make it clear where all these efforts are headed,” he said. “Getting rid of old faces is a baby step towards rejuvenating the party. 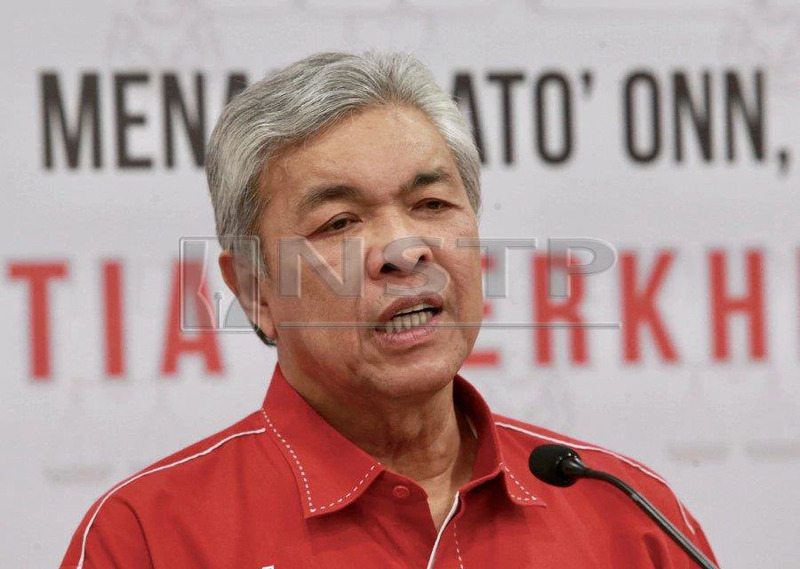 Zahid has to either step up to show some leadership or step back,” he said. He thinks Rembau MP and former Youth chief Khairy Jamaluddin could be the chosen one to helm Umno as others “were not charismatic enough”. Umno vice-president Datuk Seri Ismail Sabri Yaakob said “no”, while Pontian MP Datuk Seri Ahmad Maslan said there is no need to act in such a manner, when asked about it. Ahmad described it as “rumours created by those unsatisfied about losing the presidency. “There are those who refuse to accept that they have lost and others have won,” he said. “He (Zahid) has been positive and happy for the past few days. Let’s hope it stays that way,” one said. Then again, a “divorce” with a favourable “separation agreement” can put a smile on anyone’s face.